On Saturday, May 13, among glasses of champagne, and a guest appearance by Brandi Redmond, of Bravo TV’s Real Housewives of Dallas, Travisso’s Ladies Home Tour was a huge success. The free, open to the public event drew over 200 people to the community’s Information Center and Model Home Court. Redmond, who shines as the show’s free spirit is one of the stars of the hit reality show. She hails from near-by Round Rock, TX. The show delves into the intimate lives of a group of suburban Dallas housewives. Week after week fans follow the trials and tribulations along with the joys and celebrations of the housewives. During the event, the spirited Redmond dazzled loyal fans and made new friends with both charm and grace. In addition, there was plenty of time for signing autographs and posing for photographs. And, of course, in perfect housewife style, talking the daily dish. Activities Galore, Giveaways, and More! As with all Travisso events, a plethora of food and a few sweet indulgences took center stage. This year, Toll Brothers model home guests were treated to a wall of donuts with multiple choices of yummy toppings. Even the most discriminating sweet tooth was satisfied with an array of fresh strawberries to chocolate and caramel syrup, and candy toppings. Additional events included a Sparkle Lounge sponsored by Highland Homes, a T-shirt giveaway by Taylor Morrison Homes, and a men’s “Parking Lot” featuring cold beer and sports by Drees Custom Homes. The Housewives of Travisso also came out to enjoy the day and festivities. 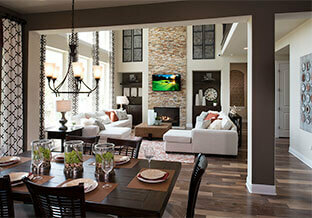 Express your own personal style and live the life you create when you purchase a new home in Travisso. Envision your dream home with first-class amenities at your door step—10 miles of hiking and biking trails, a resort style pool and fitness center, and a sense of belonging to a great community. Endless outdoor recreational possibilities, acres of open space, and blue Texas Hill Country skies rounds out your new lifestyle. Call 512.243.8583 for more information or visit today to explore our beautiful Italian-inspired master-planned community.